P1010105, originally uploaded by Sustainable Flatbush. Lixo (trash) Organico and Lixo Inorganico dancing together. Anyone know what SESC stands for? It means in Portuguese: ServiÃ§o Social do ComÃ©rcio (Social Service for Commerce). This is a national and private institution created during II World War to minimize the effects of the war, as well as to promote social equity. To have a SESC card, you need to be part of a certain system, such as commerce, education, culture , health care, and others I don’t remember now. SESC is great supporter for cheap education (whoever wants to learn languages, and subjects such as hair cut, construction, cooking, with good quality should always look SESC..it is cheap and very good!!!) They have also gym facilities, health care, cultural actions, and of course environmental ones. It is supported by the commercial society of each state and attend specially people in low-income areas where access to such thing is more difficult!!!! 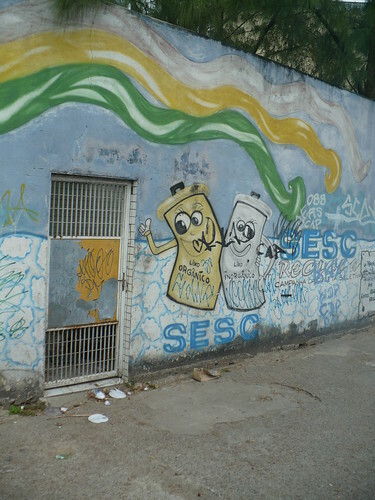 Ok, I guess that is what I can tell you about SESC!!! Hope it is helpful! Anne, I love your blog! Keep going and keep doing! You are doing just great!! !And I hope you enjoyed your carnival!